Lagant just cannot get it right. He seems to find serious problems dealing with the different women that come across his path. His first true love and his daughter’s mother, Jada, hopes that she can patch things back together with him. Will she be able to capture the good guy again before he goes bad, after he became a womanizer, fighting over the females that show him special attention that he cannot be still long enough to stay focus? Will Lagant hold on to his first love after he has a taste of freedom, living the single life again, or is he off to the races running wild? The navy is soon to release Lagant from his military duties because of medical reason. He is feeling pressured on how he would survive and support his daughter when all he knows is the military, which he joined straight out of high school. He starts to lose more of his innocence. He thinks about following the path of what he knows of his unknown father and older brother, making fast money, but he needs a team. He reunites with two of his younger cousins from Newark who are thug out and into the street life. Lagant puts a plan together that he thinks would work, or would it lead him to jail or death. 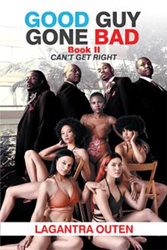 The story behind “Good Guy Gone Bad: Book II” hopes to remind readers about what and what not they should do, to know their mate before falling in love and having a baby out of wedlock and to know that it is not good to become a womanizer or a promiscuous person. Lagantra Outen was born and raised in Newark. He attended West Side high School, joined the U.S. Navy and honorably discharged after nine years. He attended Essex County College and received his associate degree in human and social service as well as certification as an alcohol and drug counselor. He is presently in his senior year at Rutgers Newark majoring in social work and minoring in psychology.